Commodore, Excellent work rescueing Ambassador Sarek. 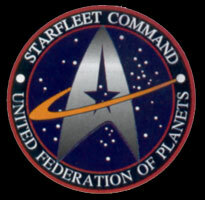 The Klingon Empire has decided to maintain a presence in this sector. Colonel K'mok will be providing assistance. In our latest message from Captain Stewart, we have learned a great weakness in the Cardassian war effort. 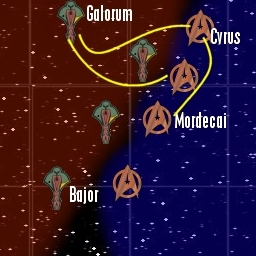 The Bajoran Underground recently found out of a massive Cardassian shipyard in the Galorum system. This system has two fully functioning shipyards that produce the Galor class cruisers. As you know these cruisers were very destructive against our lines during the Battle of Avery. The system is very poorly protected. The Cardassians believe its remote location leaves it out of danger. The Center piece of the production is the nor type mining station. This station processes ore from the the Galorum II moon, into hull plating and other componets. If it is destroyed the Yards will be useless. The station itself is well protected. But a direct assault is out of the question. If we send a fleet across the border it will be detected and we'll have a large battle break out. Captain Maxwell has come up with a very "unorthodox" plan to destroy the base. We will use a Consitution class starship to destroy the base. It will be loaded with massive amounts of antimatter.